I get a lot of email – hundreds per day. I also believe in having an empty inbox and I like to make sure that every message finds its home in my email archive before the end of each day. Over the years I’ve developed a specific approach to making sure that I’m on top of my email and that my email stays organized. Everyone has a different email workflow and I thought it might be helpful to share what works for me. My first line of defence is IMAP. I primarily use Mail on OS/X and IOS and I have mailboxes configured on at least 3 different devices – my home workstation, my work laptop and my iPhone. IMAP makes its really easy for me to get access to my email from almost anywhere with very little time wasted on replicating a new setup. 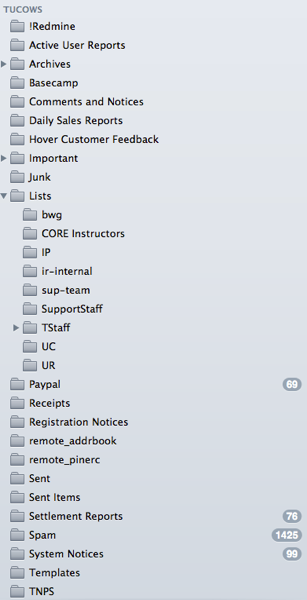 I use server-side filtering to organize my email into general folders which the email client loads remotely. This has the benefit of showing me my email in exactly the same way no matter which mail client I use. IMAP also comes with the benefit of storing all of my mail “in the cloud” without forcing me to use webmail. I have gigabytes and gigabytes of email going back to 1999 when I first dropped POP in favor of IMAP based email. I never have to worry about backing up this email, deleting old messages to save on storage space or trying to remember if that important email got downloaded at home or from work. IMAP really is the only option for email in today’s multi-machine, highly mobile email environment. The structure of the server-side filters is important as well. I filter only on source and I don’t bother filtering email from people, topics or keywords. For example, I receive a small amount of email from mailing lists. Email from each of these lists goes into its own folder. I also receive a number of work-related automated reports and status updates. Each of these gets filtered into their own folder – all the automated balance notices go into one folder, customer feedback into another, account activation and sales reports into yet another. I have dozens of folders as a result – all of which only exist on the server. Most importantly, I don’t bother filtering people, topics or keywords. If you send me an email, you’ll probably end up in my inbox. I have tried filtering messages based on whether I was cc’ed, bcc’ed or directly addressed and found it was just too much to keep track of. Simpler is better. These filters create a pretty clean inbox for me to work through each day. The rest of my email “processing” is all manual. I’ll follow this post up describing how I set up my email program to encourage my focus and avoid distractions and another describing how I decide which messages to answer, which to file, which to delete, and so on. Hi Ross, thanks for sharing your layout. Especially with folders on the server side, great idea. Do you also have a gmail or other similar account or just stick with the one? I have a number of accounts (work and personal) and I forward all of my work accounts into my main Tucows account. The reason I forward the mail to a central account is so that I can maintain one set of filters on the server. I also have a few personal accounts that I keep separate. I used the same filtering approach for these, although because they are for personal use, I don’t bother filtering them – everything goes into the inbox. Mac mail does a great job of managing multiple accounts, so all of the mail from all of these accounts show up in one unified folder structure in my email application (including my gmail accounts). Thanks Ross. I had to format my laptop a few weeks ago so started setting up folders on the hover side. Do you use the standard hover filters? That’s prob my next step…p.s. Paul got me a Surface Tablet and I love it (i can feel you cringing lol!). Hoping to use it as main back/forth device with laptop at home. Take care. Yes, the Hover webmail filters will work just fine. I haven’t played with the Surface yet, so no cringing! Happy New Year!